Due to its extremely high melting point, tungsten mill products (sheet, rod, wire, pins) are fabricated from powder and not through melting and casting. The tungsten powder is pressed into parts, sintered (consolidated) and worked (rolled, forged, swaged, or wire drawn) to the desired form. 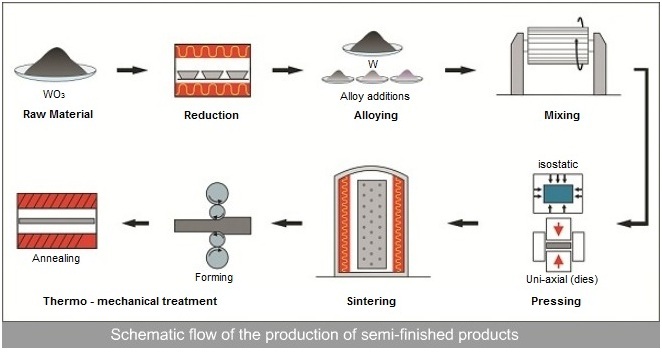 This technology, called Powder Metallurgy, was adopted from ceramics and used at first for mass production of tungsten filaments at the dawn of the 20th century. Tungsten mill products are either tungsten metal products, such as lighting filaments, electrodes, electrical and electronic contacts, wires, sheet, rods, etc or tungsten alloys. Such materials are used as components for the electronic industries, in transport (aviation, automobile, and trains), the chemical and glass melting industries, in medical technology, for power engineering and even in sport and leisure activities.